Today's Terrific Tuesday Giveaway is being sponsored by Green Fairy Quilts. Green Fairy Quilts always has an amazing selection at amazing prices!! And they are currently having a Huge Clearance on All Notions!!! So if you are needing pins, scissors, rulers, ect. . . Be sure and pop on over to check this awesome sale!!! And Green Fairy Quilts ships free in the US and discounted to international. Sweet!!! Fifty...so many things. Fifty days until December. Fifty days until ski season starts in the Mid-Atlantic region. Still fifty pounds overweight. Fifty things on my to do list. Yep, fifty plus 8 is me. Love Green Fairy-thanks to them I have at least 50 charm packs stashed! I get their newsletter and follow on Bloglovin. Thanks for the link to Green Fairy. There must be 50 things in my cart already. The free shipping is a big bonus. 50 bucks equals a fun shopping spree! I have more that 50 spools of sewing thread, and more than 50 skeins of DMC embroidery thread, and probably 3 x 50 fat quarters (mostly cut into) but still I could always use more! Thank you for the opportunity to grow my stash! I receive the Green Fairy Quilts' newsletter by email. I could definitely spend the gift 50 plus an additional 50 (or two). So many great things. I already get their email/newsletter. HaHa!! I think I have 50 quilts on my "to-do" list !! I love Green Fairy...follow them and get the email newsletter already. Ah, to be 50 again. I hope it's the rain but my feet, back and wrists hurt. My knees crack when I have to climb the stairs after my walk. And my friend and I talked about friends letting their hair show their natural grey. But I could probably think up 50 quilting projects and that I love. Thanks. I love GF. I get the newsletter. THanks. I get the green fairy newsletter. Thanks! I turn 50 in 2036! I think I have 50 WIPs! I LOVE Green Fairy Quilts! Follow them on Facebook, get their newsletter! Love them! I use aurifil 50wt and love it! I get their newsletter and I'm a very loyal customer! Winning the $50 gift certificate would be fun! Love their selections. I already follow GFQ on Instagram. Wish I could say I wasn't 50!! It was less than 50 degrees out this morning! Thanks for this giveaway. Waiting for the travel channels 50/50 show. I'm sewing the Farmer's Wife 1930 quilt and need 50 blocks for the one quilt and 49 for the other ('m spliting the original pattern in two). I would love to receive the 50 dollar gift certificate to Green Fairy!! 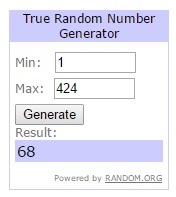 Thank you for the great giveaway! I follow Green Fairy Quilts via email. Their newsletter is great! I receive Green Fairy's newsletter and follow on Facebook and Pinterest. I remember when a can of pop used to cost $.50. I could spend the $50.00 dollars in a snap!!! Thanks for a chance to do that!!! Just signed up for their newsletter!!! Love the chance to win 50 ways to love Green Fairy! I have at least 50 fat quarters in front of me...waiting for my design karma!!! I turned 50 more than a decade ago, still going strong. I follow GFQ on Bloglovin and newsletter. I was watching House of DVF on E!, and one of the contestants lamented to Diane Von Furstenberg that she had so little time with her mom left because her mom was getting old. Diane asked her how old her mom was....and she said...wait for it...50! Diane gave her this look like - how old do you think I am? Ah, the innocence of 20-year olds! I follow Green Fairy Q on their newsletter. Hello, We have celebrated our 50th Wedding Anniversary! HI, I follow GFQ's via email. If I were only 20 years younger and know what I know now - 50 would be so much better! I could easily come up with 50 or more ways I love Green Fairy Quilts! One of my favorite shops!!! If I finish 9 more projects my UFO count (projects started, but not yet tops and tops to be quilted) will be down to 50. Oh to be 50 again. What a dream that would be. But then $50.00 to spend is so nice. Signed up for the newsletter at Green Fairy Quilts. Given my neck injury, I think I will try to spend 50% of my day in my sewing room, even though I'd prefer 100%. I need to go easy on my neck right now, or quilt while the pain pill is kicking in. I'm in the process of sewing 50 blocks with HST for a border on a quilt. It's important to remember "one block at a time" because thinking about 50 of the same blocks is a bit overwhelming. I don't do repetition very well. Thanks for the chance in the giveaway to one of my favorite on-line shops. Love Green Fairy! I follow them and receive the newsletter. I follow Green Fairy Quilts via email. I'll look for them on Bloglovin'. Hope this qualifies: I love being in my 50s! I thought 50 would be worse than it is. I follow GRQ on Facebook and also order from them all the time. I love their "free shipping". They are so easy to work with. Thanks Clint! 50 bucks to Green Fairy Quilts...LOVE IT!! Now that we're having 50 degree weather, $50 to Green Fairy would be awesome! I remember my 50th birthday....good times. Thanks. I get the emailed Green Fairy Quilt newsletter! Great prices and sales! Oh, to be 50 again! I follow Green Fairy Quilt's on Facebook. There must be 50 ways to make a half-square triangle! Love your blog, and would love to win the GC. I follow GFQ on FB and email subscriber. Thanks for the giveaway! I just started following Green Fairy Quilts on FB. I will turn 50 in 2 years. When did THAT happen?!? I graduated from high school 50 years ago. Yikes! I just told everyone how old I am! My aunt used to send a 50 cent piece in our christmas card every year (you got a quarter on your birthday). We loved getting that lumpy envelope in the mail (and saved the 50 cent pieces instead of spending them). What a wonderful and generous prize. I think I must have 50 quilt tops that need a few more colors before I finish them. Actually I think I'm down to only 8 right now! 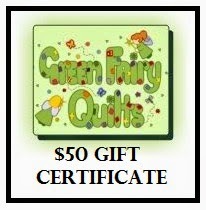 I would love to have 50 gift certificates so I could share them with my fellow quilters. What fun we would have shopping at Green Fairy Quilts. Like many, I have over 50 projects on my To Do list! I definitely have more than 50 quilting projects and ideas in my head.. I subscribe to the GFQ newsletter. Hey Melissa, This is an easy one, since I live on 50 Ernest Street! Do you think this will be my lucky number today since it's in my address? Thanks for the chance to win! My sister turns 50 this year. I should probably get started on her quilt! Thanks! I follow Green Fairy Quilts on Facebook and you, too, of course! My husband and I recently celebrated our 30th wedding anniversary. I hope and pray that we live to celebrate 50 years together! Thanks for the giveaway! I think I could make 50 projects by the end of next year. Sounds ambitious, right? I follow Green Fairy Quilts in every way except Bloglovin. I just don't read a lot of blogs! I follow Green Fairy Quilts on Pinterest and Twitter. I am over fifty. Sniff. I LOVE Green Fairy Quilts! I must shop with them 50 times a month! Many thanks!! My secret is that I am over 50 years old. Thanks! I think I have at least 50 projects on my to do list. (Sigh) Not sure when I will ever get them all done. Thanks for the chance!! I receive their newsletter, follow their blog, and spend all my money on their precuts! They are my precut go-to store! Thanks again! I must have 50+ projects on my to do list but I am 50+ and retired so have lotsa time to work on more...lol. I follow GFQ with Bloglovin. Thanks! I would love $50 of spending cash just for fabric. Thanks! Life begins at 50! Thanks for sharing the giveaway. I felt kind of old when I turned 50 and that was a few years ago! The great thing about this time of life is that I can quilt without many distractions! I subscribe to GFQ newsletter. I could use 50 dollars to spend at GF. I love their fabrics! I follow Green Fairy on Bloglovin plus I receive their newsletter. To bad I am more than 50 years old! I 'Liked" Green Fairy on Facebook! Would love that $50 certificate from Green Fairy! I love Green Fairy Quilts! Judi is so talented. I get their newsletter and follow her blog. I love Green Fairy Quilts via Facebook, and email. I must have at least 50 different fabrics, but I always want more! Don't we all? Found a 50 dollar bill while cleaning up a desk. Yahoo! I have completed more than 50 quilts. I follow Green Fairy Quilts on most social media forms, and also have her quilting book. Wish I was 50 again! I don't think having 50 charm packs is a problem! GFQ is one of my favorite shops and I would be so happy to have $50 to use there! I'm signed up for Green Fairy newsletters. I have more than 50 years sewing experience. Oh my goodness, love just thinking what I would do with a gift certificate for 50 dollars! I love being over 50! 60 is getting way too close though. I'm not OLD...YET, at least I don't feel like it. Thanks for another Terrific Tuesday giveaway! Maybe it will be my turn to be the lucky winner. I'm in the process of cutting out 72 charm squares and 204 3" squares. So far I've cut over 50... I think I have a few more to go. I 'm on the mailing list for the Green Fairy Newsletter! I'm over 50! I like Green Fairy on facebook! Can't wait till morning temps are below 50! High today is 92- ready for fall to come and stay in Texas! I follow Green Fairy on Pinterest. I might even follow them on Facebook on and Bloglovin and i get their newsletter for sure. But I KNOOOW I follow them on Pinterest. Lol. I have way to many people i follow i think. AND I LOVE THEM ALL! Thank you for the great give a way tuesdays. I wish I were 50 again!!!! I'm liking Moda's new line "Good Karma." over at green Fairy Quilts. Cool, bright colors - my favorites! I have more time to quilt, now that I'm in my 50s ! On February 2 of this year I turned 50 years old. Also this month I'm 10 years cancer free! YAYme! I follow Green Fairy Quilts on Blog Lovin and also get their newsletter. I turned 50 five years ago! I have gotten Green Fairy Quilts newsletter via email for a long time now! We just celebrated our 50 +1 anniversary. I am retiring next year & have at least 50 projects on my list to get to. I already Like Green Fairy Quilts on Facebook & receive their emails. I'm already a subscriber to Green Fairy Quilts' newsletter. WOWSER --- $50 in fabric from GFQs is my idea or a super 50 +21 birthday! Thanks for the opportunity. Oh, Green Fairy Quilts carries Dear Jane electric quilt design software. I would like to try it. I love GF, and follow on pinterest, facebook, bloglovin, and newsletter.